Back Issue of the Week: The Joker #6 (March/April 1976). 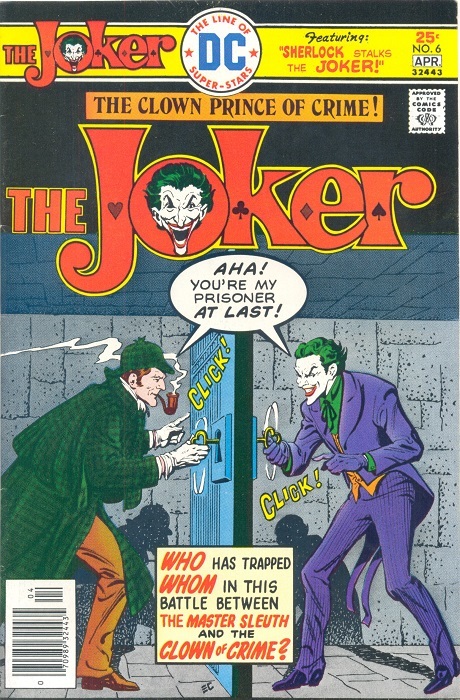 A classic example of the “villain as hero” comic book series, The Joker had a short but memorable run in the 1970s. Because he was the villain, despite being the star of the book he usually met with a Comics Code Authority-mandated defeat at the end of each issue. However, plenty of guest-stars, heroes and villains, popped up in the comic, including Superman’s nemesis Lex Luthor, the Creeper, Catwoman, and, as in the issue pictured above, Sherlock Holmes! Okay, in the story it was an actor playing Sherlock Holmes, but close enough! An oddball classic by Denny O’Neil, Irv Novick and Tex Blaisdell! This entry was posted in Back Issue of the Week on November 10, 2016 by Mike.